What is Chemical Weathering? How rocks break down from chemical agents? What can cause chemical weathering? Water with chemicals in it, weak acids, and air. 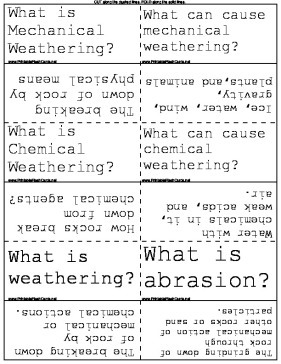 What is weathering? The breaking down of rock by mechanical or chemical actions. What is abrasion? The grinding down of rock through mechanical action of other rocks or sand particles. What is acid precipitation? Rain, sleet, or snow with high amounts of acid. Name 3 things that cause abrasion? Rocks against rocks, wind blowing sand, and gravity when rocks fall on each other. What causes oxidation? Iron combines with oxygen and creates oxides or rust. How does the composition of rocks affect weathering? Softer rock weathers faster than harder rock. How does surface area affect rate of weathering? The more area exposed the faster the rock can weather. How does elevation affect weathering? It weathers faster at higher elevations because of greater wind, snow, ice. How does climates affect weathering? More middle climates with lots of freezes and thaws weather faster then arctic or desert climates. What is differential weathering Process by which softer rocks wear away and leave harder rocks behind. What happens in warm humid climates to weathering? They are exposed to more moisture that interacts with the sun. What is soil? A lose mixture of mineral fragments and organic material that can support plant life. What is parent rock? The source of the mineral fragment in a type of soil. What is soil structure? The arrangement of soil particles, can be even or clumpy. What is humus? Dark organic material in soil from the decayed remains of plants or animals. What is bedrock? Layer of rock below the soil. What is leaching? The removal of substances dissolved from rock or soil due to passing of water. What is soil texture? Soil quality of particles. What is soil made of? Rock fragments and organic material. Why is topsoil in tropical climates thin? Because frequent rains leach away nutrients leaving soil very thin. Which climates have the most productive soil? Moderate climates with frequent freezes and thaws. What is infiltration? The ability of water to move through soil. What are 3 benefits of soil? 1. Provides minerals and nutrients for plants to grow. 2. Provides a place for animals to live. 3. Prevents flooding and water storage. What is soil conservation? Ways to maintain the fertility of soil by preventing erosion or the loss of nutrients. What is erosion? The process by which water, wind or gravity transports soil from one location to another. Why is soil important? Helps plants grow, provides a home for animals, and prevents flooding. What can soybeans or peanuts do for soil? Help restore nutrients between harvests.